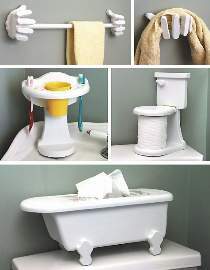 Five different whimsical bathroom fixtures include a bathtub tissue box, a tiny toilet that holds a spare roll of tissue, a toothbrush and cup holder, and two different styles of hand towel racks. Projects are made from 3/4" stock. Patterns for all five projects drawn FULL SIZE. Order hardware parts package for toilet tissue holder separately or see Special Offer (includes BOTH #W2322 Plan and #1849 Hardware Package). These are the hardware parts you need to make the toilet-shaped tissue paper holder project only. Includes the dowel, hinges, hinge screws and, because you are making a miniature replica, a pushbutton music box that plays the tune Its a Small World. Project plan, wood, wood dowel for hand towel rack, and paint are not included.